Africa. In all its war-torn, sun burnt, deserted, dangerous, magnificent glory. A landmass so large it is home to such diversities as rainforests, snow-capped mountains, arid deserts, mighty rivers and ravines which give life to a continent which gave life to the entire human race. 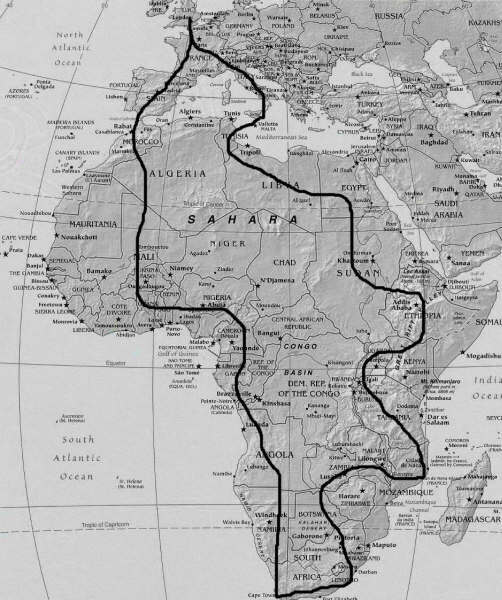 Our route will take us from the far flung bush villages to the sprawling, broiling metropolis of the cities, from the age old tombs of the Pharaohs in Egypt to the all too recent graves in Rwanda, from the endless wind-scythed waves of the Saharan sand dunes to Table Mountain and the Great White Shark infested waves off the Cape. Depart London, like all true New World explorers and into Europe. South through Europe, scaling the Alps in Switzerland and then meandering down to the Mediterranean through Italy. A short ferry to Tunisia, then Libya, Egypt, Sudan, Ethiopia, Kenya, Uganda, Rwanda, Tanzania, Malawi, Mozambique, Zimbabwe, South Africa, Namibia, Botswana, Angola, DR Congo, Congo Republic, Gabon, Cameroon, Nigeria, Benin, Togo, Ghana, Burkina Faso, Mali, Mauritania, Western Sahara, Morocco, Spain, France again and finally home. 31,000 miles and 38 countries. See an updated map at www.mapvivo.com. Just search for ‘Tohelandback’ profile.